Blooming Direct voucher codes - save up to 10% with april 2019 offers! Having a beautiful garden you can relax in is definitely one of the secrets to a content and happy life. And with a Blooming Direct voucher, you can fill your outside space with all your favourite flowers, plants and shrubs – all without breaking the bank! From beautiful begonias to fantastic fuchsias, Blooming Direct vouchers will help you get the garden you've always dreamed of. Blooming Direct started life on the island of Jersey, an area known for its fascinating horticultural attractions. Later, it moved to South Lincolnshire, a region similarly blessed with a booming horticultural industry. 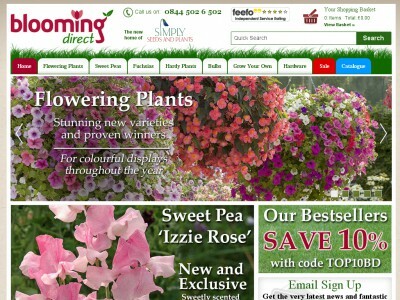 From there, Blooming Direct has flourished to become one of the UK's favourite online seed and plant suppliers. The team at Blooming Direct boast over 30 years' experience in the industry, so they know all that there is to know about designing, planting and maintaining beautiful gardens that will thrive in the UK. The majority of their plants are grown under personal supervision from the team, either on Blooming Direct's own dedicated nursery or on one of their partner nurseries close by. This means that when you order with Blooming Direct, you can be sure of the very freshest plants - picked fresh from the nursery to order, handled as little as possible and arriving with you in perfect condition. Recently, Blooming Direct also joined forces with Simply Seeds and Plants to offer you a fantastic range of seeds and plants from the well-known sweetpea and fuchsia specialists. At Blooming Direct's comprehensive website, customers can browse a wide range of seeds, flowering plants, bulbs and more, all specially selected to perform well in British gardens. Looking to add a splash of colour to your garden or windowbox? Blooming Direct can help you transform even the smallest space with beautiful blooms like begonias, busy lizzies, geraniums, petunias and more. Or perhaps you're searching for the perfect fruit and vegetable seeds to start a productive allotment? They've got a wide selection for you to choose from, along with everything you need to get started on the route to 'growing your own'. Blooming Direct even stocks a collection of hardware and gardening tools designed to help even the busiest gardener relax and get the job done. From planters and baskets to plant feed, fertiliser and more, there's everything you could want to get your garden looking the way you've always dreamed it would. Want to get started with Blooming Direct? With a Blooming Direct voucher you can enjoy fantastic savings on their wide range of seeds, plants, flowers and garden tools. So whether you're a green-fingered garden-lover or a novice getting started, Blooming Direct voucher codes will save you money while you shop. Majority of plants grown in their own nursery in the UK. Browse our website until you find a Blooming Direct voucher that suits you, then navigate to their website to begin shopping. Enter your Blooming Direct discount code in the box provided and click 'Apply code'. If you've enjoyed shopping at Blooming Direct, you might also like to check out more great deals on garden products and more at stores like B&Q or Homebase. Or, if those aren't right for you, you'll find plenty more deals to browse in our Home and Garden section. Enter your details and click 'Save and continue'. Review your details and click 'Continue'. Enter your payment details and click 'Place order securely'. Delivery charges are calculated on your individual order and may vary dependent on the size and weight of your package. Need to speak to the team at Blooming Direct? Whether you have a question about your order, want some expert advice on the right planting for your garden or simply want to find out more about how you could make big savings with Blooming Direct discount codes, you can contact the Customer Services department by telephoning 0844 502 6 502. Want to find out more about planting your dream garden with Blooming Direct? The company maintains a profile across all your favourite social media networks. Follow them for access to lots of exclusive content including competitions, promotions and more. You can also use these pages to find out more about saving money with Blooming Direct vouchers. Don’t forget to check them regularly, as you can never be sure when a free Blooming Direct voucher might be waiting for you! Buy now online at www.bloomingdirect.com. I was looking forward to finally getting started on my garden, but the price of plants in my garden centre soon put me off. Luckily, I discovered a Blooming Direct voucher online. 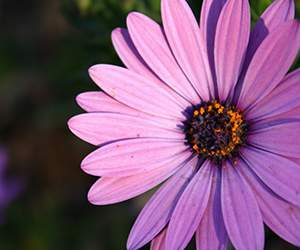 With Blooming Direct vouchers you can get great deals on a wide range of seeds, bulbs, flowering plants and more at bloomingdirect.com. I used my Blooming Direct voucher code to get a fantastic price on some heirloom fruit and vegetable seeds to start my own allotment. So why not grow your dream garden with Blooming Direct voucher code.